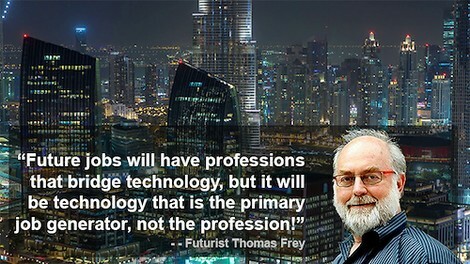 "Future jobs will have professions that bridge technology, but it will be the technology that is the primary job generator, not the profession." AI-teacherbot educators – In 2040 we will be living in a world that will require higher caliber people to make it work, and it’s rather preposterous to think our existing systems can suddenly start producing better results. AI-enhanced teacherbots are coming and the ones who benefit the most will be the ones who start making an early transition. Im ebensolchen Format gibt es insgesamt 20 Berufsfelder – von "Driverless ground crews" über "Personal Health Maestros" bis zu "Robot Sherpas" und "Data Junkies". German industrial giant, Siemens, recently hosted an Innovation Day that I participated in at their Chicago design center to give thought leaders in the U.S. a first look at many of the cutting edge technologies they're working on.